The PFA261 floor scale is ideal for pallet loading and general weighing in shipping, receiving, and manufacturing applications. The PFA569 lift floor scale simplifies washdown in hygienic applications. Its easy-to-lift platform allows quick access to the interior of the scale for thorough cleaning. One person can lift the platform manually. 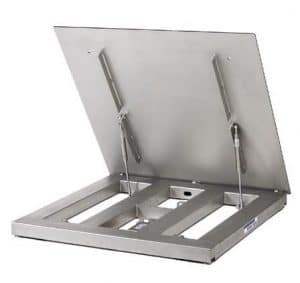 Made entirely of stainless steel, the PFA569lift floor scale is durable enough to provide accurate, repeatable weighing while standing up to constant use in wet and corrosive environments. A versatile design allows installation in a pit or on top of the floor. Adjustable feet make it easy to level the scale on uneven floors or when moving the scale to a new location. The PUA574 floor scale is built for heavy use in industrial environments. Its rugged construction makes it durable enough to meet the needs of facilities involved in discrete manufacturing, warehousing, or heavy industries. The PUA574 floor scale combines robust construction and an exceptionally low profile. It is durable enough to provide accurate, reliable weighing while standing up to constant use in industrial environments. Integral side and end guards protect the load cells from accidental side-impact damage caused by forklifts and other equipment. The platform’s ultra-low profile simplifies the job of moving loads onto and off the scale. Optional ramps are available to eliminate the need for lifting loads onto the platform. 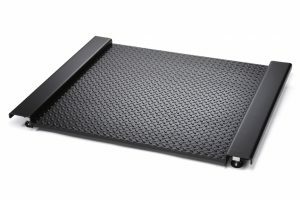 Our standard tread-plate surface provides safe footing for workers. Adjustable feet make it easy to level the scale on uneven floors. Our 2256 VLC floor scales are fully electronic with a low profile that makes them easy to load and unload. They are rugged enough to stand up to tough industrial environments. Optional 304 and 316 stainless steel versions are designed specifically for the harsh, wet environments of the food industry. Capable of withstanding 100% end loading, these floor scales are ideal for handling the forklift traffic and concentrated-load applications that are common to shipping and receiving operations. Finest Floor Scale. Built Tough – Built to Last. A mainstay in the Floor Scale Line up. 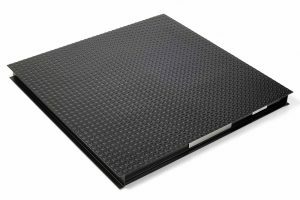 The VERTEX model 2158 floor scale uses only the highest quality components and the latest techniques in design and manufacturing to provide the most consistently accurate, durable and dependable floor available today. Available in a large matrix of standard sizes and capacities, mild steel or stainless steel the 2158 has an extensive array of options to many to list and also can be manufactured to your custom size requirements within a couple weeks. Manufactured to ISO 9000 standards you can rest assure the VERTEX will provide a lifetime of performance for the most demanding environments. The model 2256 are shipped completely assembled and tested prior to shipping, and provide an economical solution to your floor scale weighing needs. Completely self contained, the 2256 has ample clearance between the platform and floor permitting easy lifting with a forklift for convenient portability requirements. The 2256 is available in mild and stainless steel, with capacities of 1,000 to 10,000 lbs. Standard Platform sizes; 4’x4′, 4’x5′, 4’x6′ 5’x5′ and 5’x7′. Like the 2158, the VLC line can be customized to virtually any size that you may need. 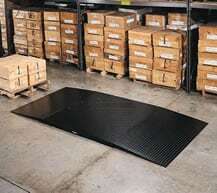 The assortment of High Resolution floor/pit scales of the K-line includes weighing ranges from 600 to 6000 kg with a verificable resolution up to 1×6000 e. The weighing platform sizes vary from 1250×1000 mm to 2000×1500 mm. The hybrid construction – electromagnetic force compensation cell and lever arm system – guarantee optimum linearity with slightest corner load tolerances. The individual models are available as stainless steel- respectively as hot galvanized version and can be used in wet or dry areas. All models can be used in hazardous areas of zone 2/22. For greater detail on the K-Line floor scales – visit the High Precision & Laboratory link below.